Some people ask about equipment for goalies and wonder why goalie gloves are important. The more the goalie can play with the wrists to the rear of the shaft, the better wrist rotation is available during the save. This exposes the thumb tip. Regular gloves do not have thumb tip protect. Thus, the goalie glove is meant to protect the thumb tip using a plastic tip. Top of the line gloves (e.g. STX Cell and K18 Goalie gloves) protect the side of the thumb, the fingers and the back of the hand more than regular gloves. With the shooters, even at the younger levels, shooting harder and harder, goalie gloves are a must (for both boys and girls goalies). At camp time, when the keeper and the shooters are improving their game, these gloves are even more vital since the shooters are less accurate as they try new things and the keepers are more exposed as the try more productive grips and moves. Goalie gloves - don't leave home without them. 12" are for youth and 13" for high school and above. 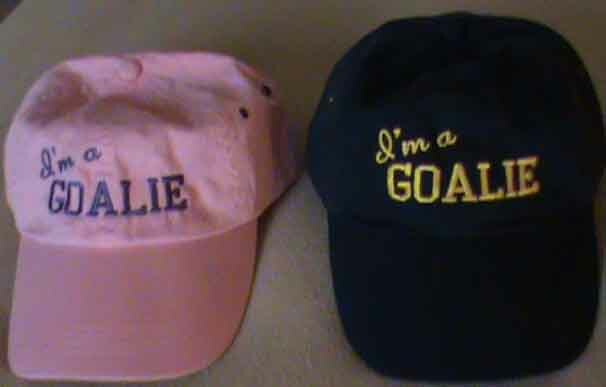 New "I'm a GOALIE" hats in Navy Blue with Gold Lettering or Pink with Purple lettering - get your today.